Blog | Peachy Keen Stamps	| Peach-tinted clear stamp company based in Green Bay, WI. 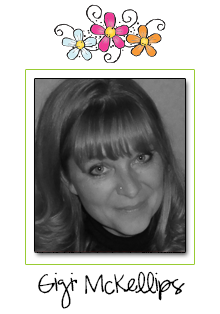 We specialize in stamp, pattern, and digital die cut SVG designs that keep crafters stamping and giggling worldwide! Gigi McKellips :: Winter Fun! Hello everyone! 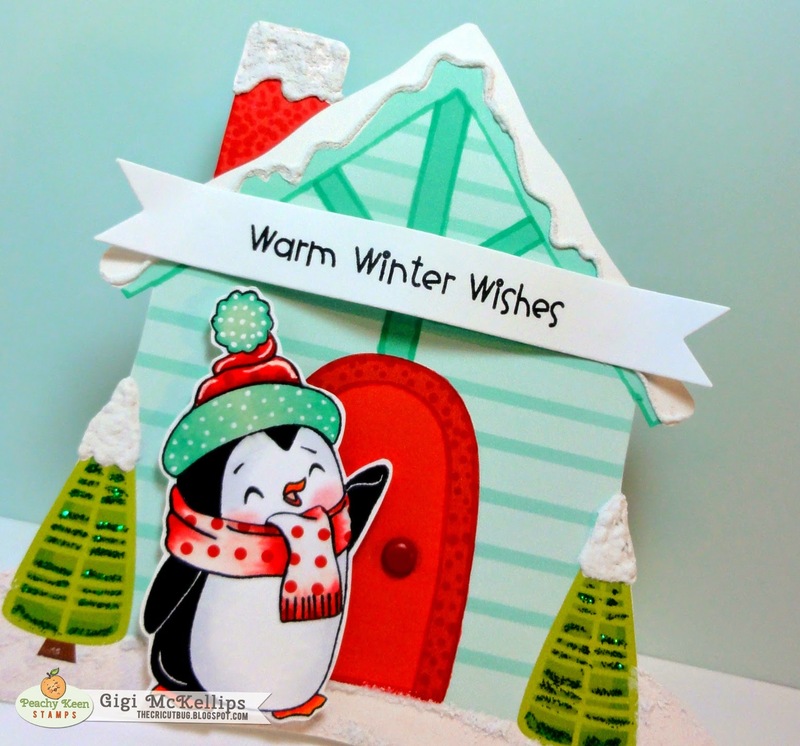 This is GiGi from The Cricut Bug and I am sharing this sweet winter card.Now that Christmas is over we can move on to some fun Winter themed cards! Didn’t this turn out just adorable! 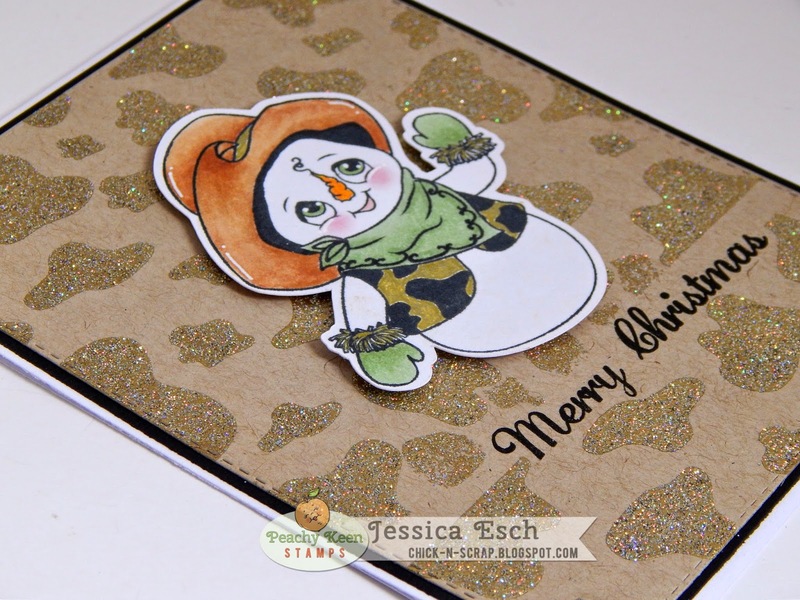 I love how the snow gives this card so much texture. I printed and cut the house from the Miss Kate Cuttables Winter Lodge. I used my Copic markers for the colored highlights, Stickles on the trees and a DecoArt Snow Writer for all the snow. 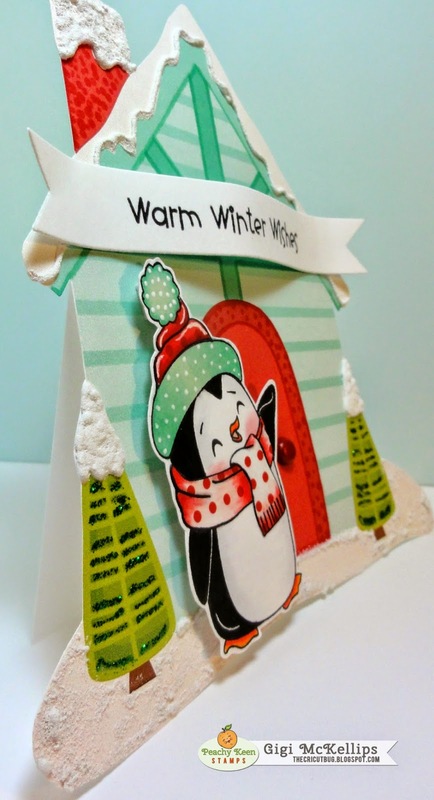 I also added a brad for the door handle and cut a plain house shape for the back to create the shaped card. 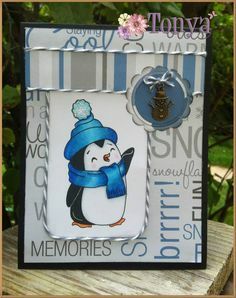 I stamped and paper pieced that adorable penguin from the PKSC- 19 July 2013 SOTM set and added him on pop dots. To finish, I added the sentiment banner and stamped the sentiment using the PK-1449 Holiday Sentiments. Filed under Uncategorized. Tags: Gigi McKellips. 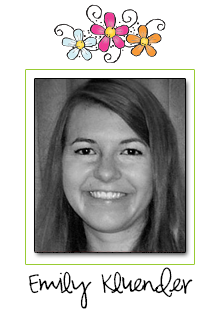 Emily Kluender :: Face Day! Hi Peachy friends! It’s Emily from Creations of an Army Wife and today I’m sharing a Face Day project. 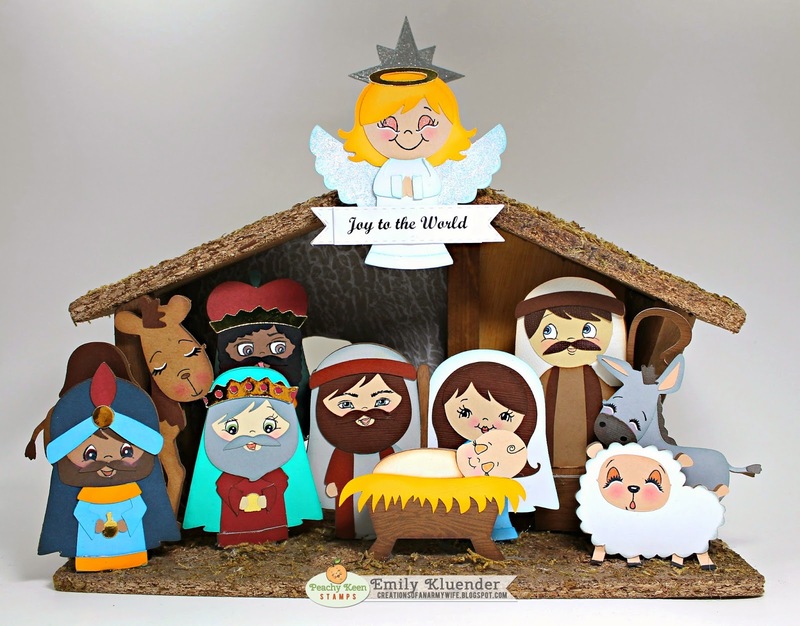 I know Christmas has just passed but I wanted to share this nativity scene I created using Kathy’s fabulous face assortments. They really helped bring these paper pieces to life! I found this little nativity barn last year on clearance after Christmas. I couldn’t wait to finally use it for this year! 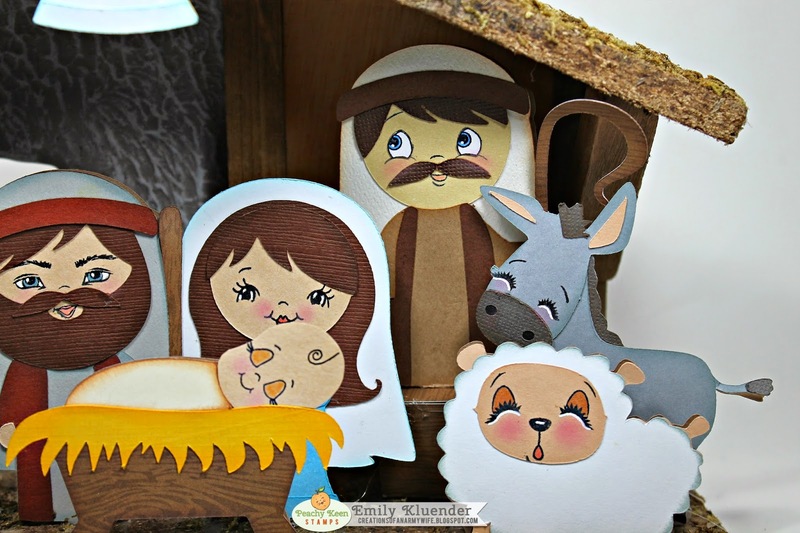 For my scene I used cut files from Pretty Paper, Pretty Ribbons called Nativity 1 and Nativity 2. 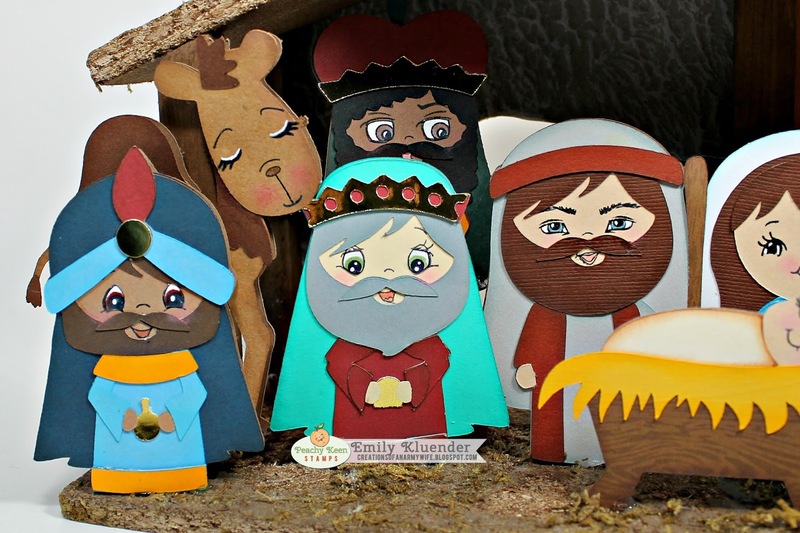 For the baby Jesus, I used PKS-Just Baby Faces Assortment. I colored his eye lids in with a Copic marker and drew his little strand of hair on with a Micron Pen. For the angel, I used the cute PKS-Cherub Face Assortment. I also colored her eyelids in with a Copic marker and then added Stickles on top. I accented her eyes with a white gel pen. Her halo was cut out using gold foil paper but just doesn’t show in the picture unfortunately. I also used Stickles on her wings to make them shine. For the banner I used My Creative Time’s Vintage Stitched Label Die to cut out the sentiment. For the cool camel, I used PKS-Here Kitty Kitty Face Assortment. I accented his eyes with a white gel pen and colored in his nose with a Copic marker. I extended the mouth using a Micron pen. For Wiseman #1 (grey beard), I used PKS-Wide Eyed Kids Face Assortment. For Wiseman #2 (brown beard), I used PKS-Retro Face Assortment. For Wiseman #3 (brown beard), I used PKS-Winter Wonderland Face Assortment. I colored each one of their eyes in with different Copic markers. It was so nice to use these assortment again since I had the chance to use them in awhile. For Joseph’s face, I used PKS- Laughy Taffy Face Assortment. For Mary’s face, I used PKS-Princess Face Assortment. I colored in Joseph’s mouth and eyes in with Copic markers. I use a white gel pen to fill in Mary’s eyes and colored her lips in with a Copic marker. For the Shepard, I stamped on his face using PKS-Sweet and Innocent Face Assortment. I colored his eyes in with a Copic marker. 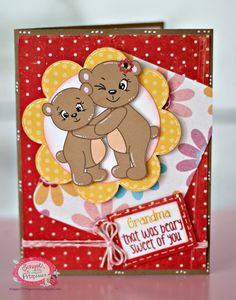 For the adorable little sheep, I used PKS-Teddy Bear Face Assortment. I colored in his eye lids and mouth with Copic markers. I accented his eyes with a white gel pen. I just love how I could use a bear face on my sheep. Love how these faces are so versatile! For the cute little donkey, I stamped on his face using PKS-Medium Critter Faces. I accented his eyes with a white gel pen. These animals are just too cute and really bring a great element to the scene. This project was so much fun to create and I don’t have the fear of little ones breaking it. Always nice to use these fabulous assortments in a fun new way! Thank you so much for stopping by!! Please be sure to check out the fabulous sale going on and the December Specials! 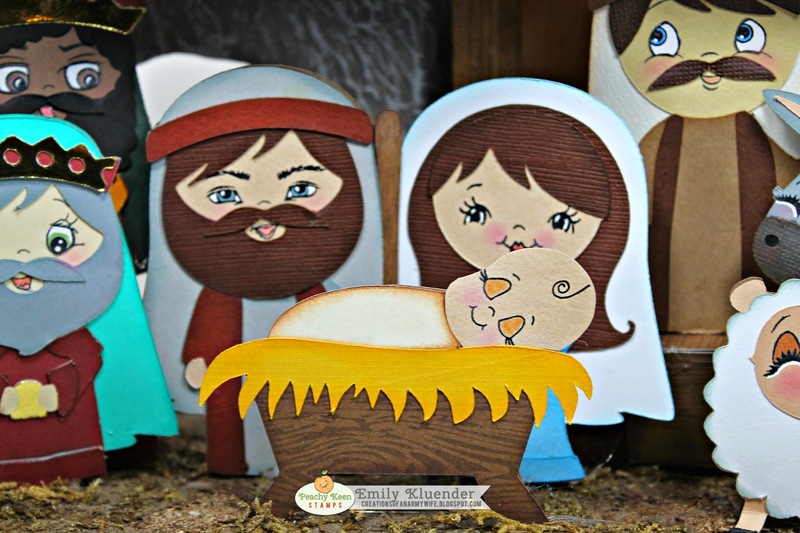 Fabulous deals on amazing Peachy Keen Stamps! Happy New Year from Peachy Keen Stamps!! We’re cleaning up the website and the warehouse at Peachy Keen Stamps! Now on CLEARANCE are ALL of our metal dies, painting books, pattern packets and stencils, not to mention a lot of stamps too! Once they’re gone, they’re gone for good! Quantities are limited so get yours today! You can use the following promo codes to save additionally on your entire order until January 1st at Midnight CST. Use PROMO CODE: SAVE35 Save 35% when you spend 100.01 and over! Note: All orders over $75.00 (after discounts) ship FREE EVERYDAY! These discounts are off of our already low prices in all categories including our December Specials and CLEARANCE items too. We had a beautiful Christmas and we hope that you did too! Happy New Year, everyone! With much Love and Appreciation for all you do for us! Filed under Face Day. Tags: Emily Kluender. We had a little party this week over in The Peachy Place, for Kathy J’s birthday, and there were some absolutely amazing creations shared. Today, we’d like to share these creations for those of you who may not be a member or have seen them. If you’re not a member of The Peachy Place, then you should come on over and join us. There’s always lots of inspiration and something fun and wonderful being shared, and we’d LOVE to have you join us! Enjoy these birthday card creations from our friends, and we hope you had a Happy Birthday, Kathy!! Thanks so much to ALL of our friends who joined in the fun to help celebrate Kathy, who brings us such wonderful images to work with! Hello everyone! This is GiGi from The Cricut Bug and I am here to share a tutorial for a snow/sky background with you today. 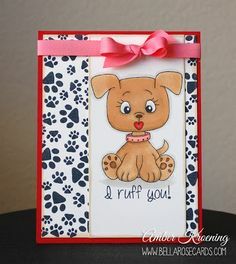 Here is a pic of the card we will be making today. To start with the background, I stamped the tree from the Faceless Flake and Christmas Tree stamp set onto my card mat to the left side. I also hand cut a piece of white scrap paper for the stencil line for the snow. 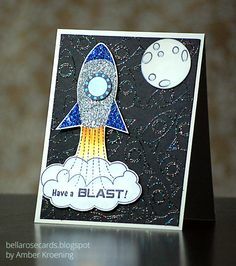 Place the scrap piece of white over your card in the center and ink up the blender brush with the chalk ink. Using circular motions, ink in the sky with the blending brush. It’s ok to go onto the tree a little as long as you’re using a light color. When the sky is all inked in, remove the white scrap paper and there you have it! A snow/sky background! 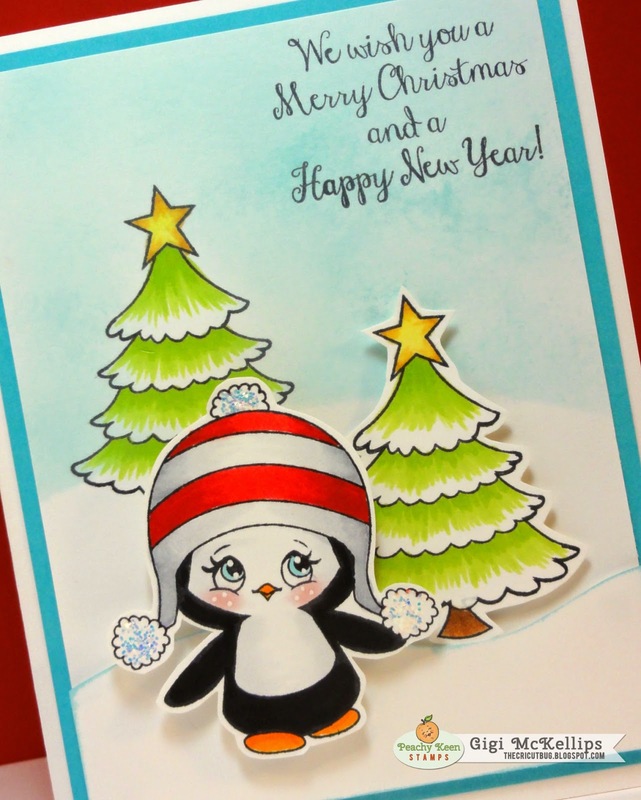 Now you will color the tree on the background, and stamp and color the extra tree and penguin. Cut them out with scissors along with another piece of scrap white for the snow. This doesn’t have to be perfect, snow comes in all shapes and sizes LOL! Do make sure it is the width of your card mat though. Ink the edges of your small snow piece with the blue and then you’re ready to assemble. 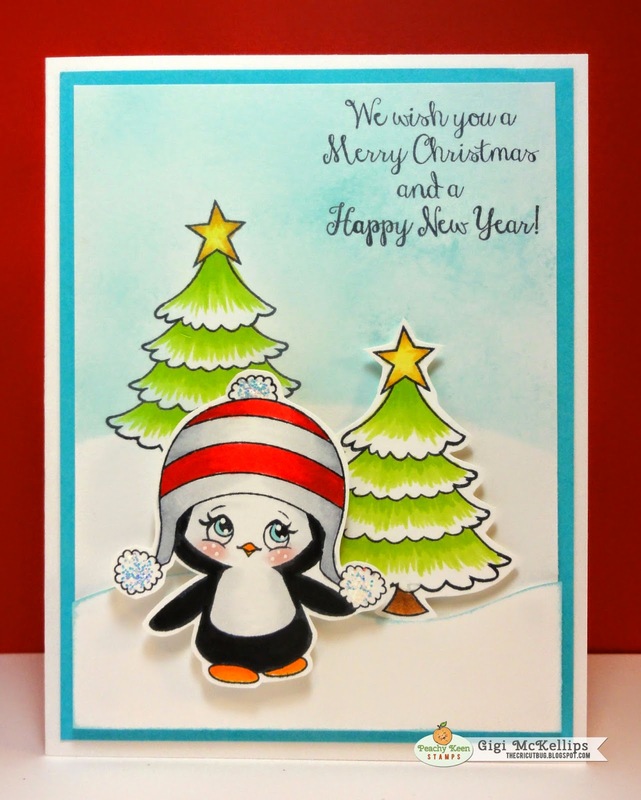 I mounted the second tree, penguin, and snow on pop dots to give this card lots of depth. After it’s all put together, the last thing to do is stamp on the sentiment from the Holiday Sentiments stamp set. Here is the card all finished. I hope you all enjoyed my tutorial and will try this technique for yourself! Filed under Tutorial. Tags: Gigi McKellips. 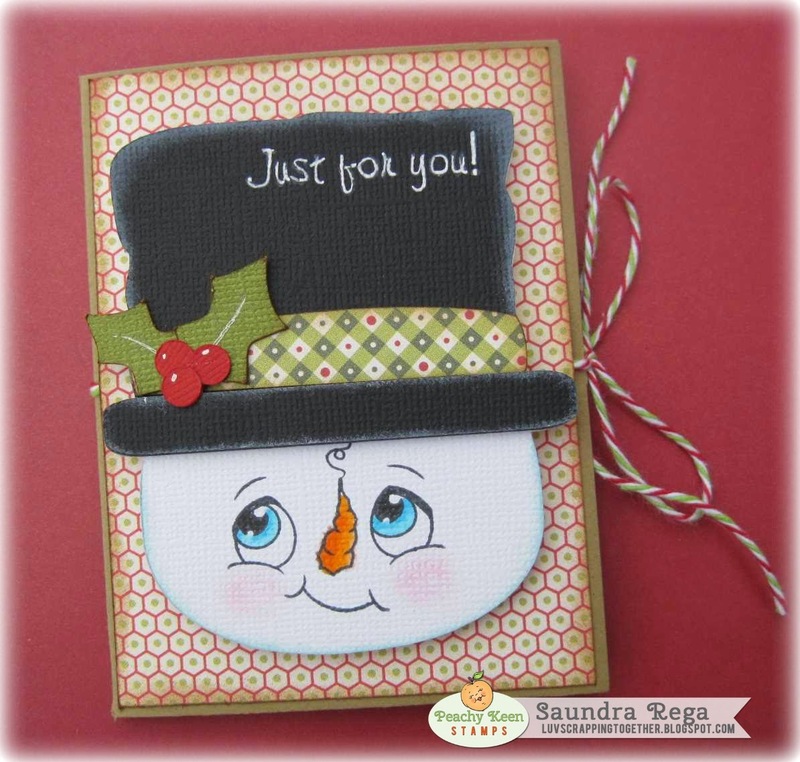 Saundra here today to share a fun Peachy Keen Stamps Face Day project. I know many of you, like me, have probably bought a few gift cards to give as holiday gifts this season. Gift cards are an easy gift but don’t seem to have the same impact as other gifts because there isn’t much to unwrap. So, I like to create gift card holders for my gift cards. Of course, if you add Peachy Keen Stamps you have really brought them up a few notches. 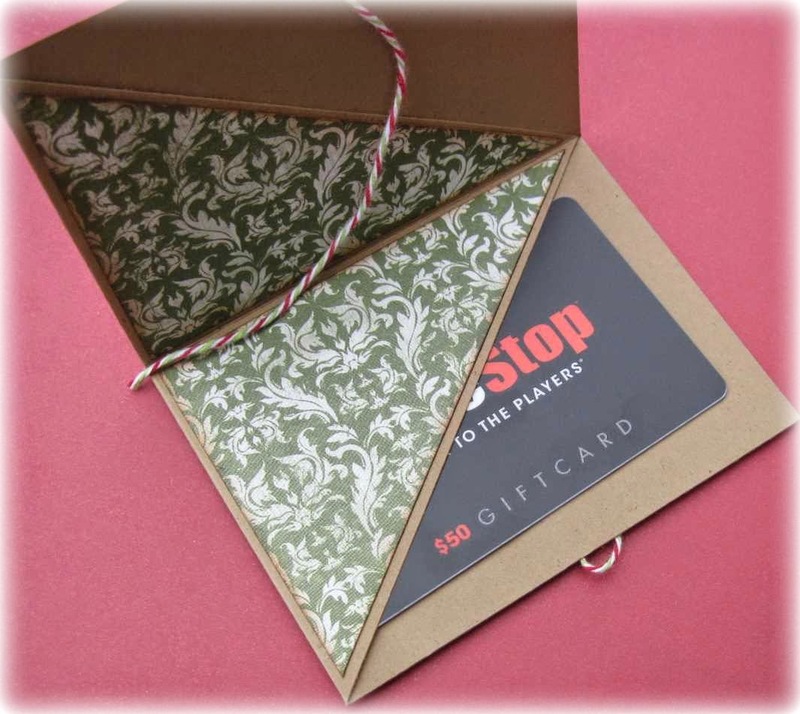 The gift card holder itself is just a 6×8″ piece of cardstock that I scored at 3″ on the 6′ side and 4″ on the 8″ sided and folded. I cut away a portion on the inside and glued it down the center to creat a pocket for the gift card. The fun part was decorating the outside. For my cute faces I used a cut file from My Scrap Chick called Sweet Winter Faces. Ech one has a different Peachy Keen Stamp Face. I love PKS PK-1445 Happy Snow Couples Face Assortment. I colored the cute snowman’s face in with Copic Markers and added a sentiment from PK-859 Christmas Greeting Words. My penguins face is from PK-1448 Happy Penguin Couples 1 1/8″ Faces and the sentiment is from PKSC-31 July 2014. This cute ginger’s face is from an oldie but a goodie set. PK-560 Dolly Dumplins Face Assortment was perfect for this ginger! The sentiment is from PKSC-31 July 2014. I had a lot of fun putting these guys together and hope I’ve provided a bit of inspiration to you, too! I wish you all a very Merry Christmas and Blessed New Year! Filed under Face Day. Tags: Saundra Rega. It’s that time once again when we get to share some of the awesome creations YOU have shared with us! This line up of winter friends made us smile! ENJOY!! Thank you all so much for sharing! These cool cuties are too adorable!! Here’s a little something special for all of you who have made the PKS Round-Up. Grab this badge and proudly display it on your blog, or Facebook page as our thank you for sharing your amazing creations. If you are in the showcase list today or have been in the past, it’s all yours!! Filed under Peachy Keen Round-Up. Hi everyone! It’s Jessica from Chick-n-Scrap. I’m here to share a trendspotting project with you today. 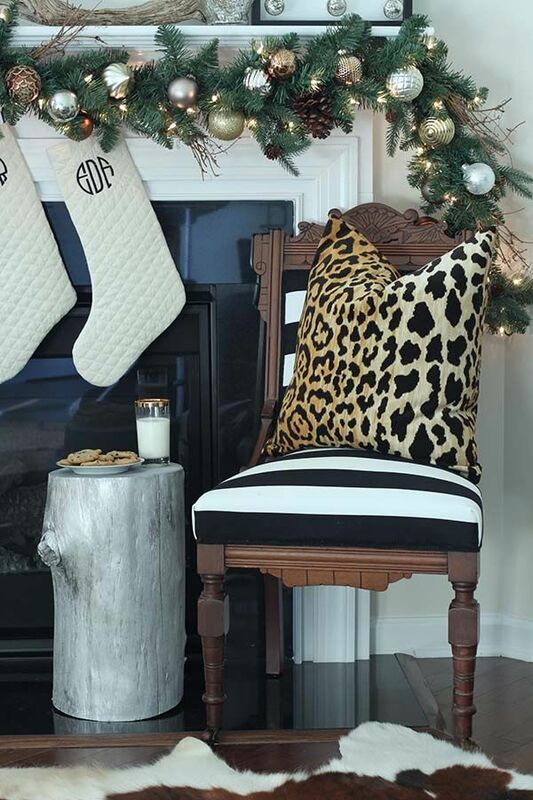 Christmas is in the air and GOLD is big right now so while searching the wonderful world of Pinterest I came across this gorgeous picture. 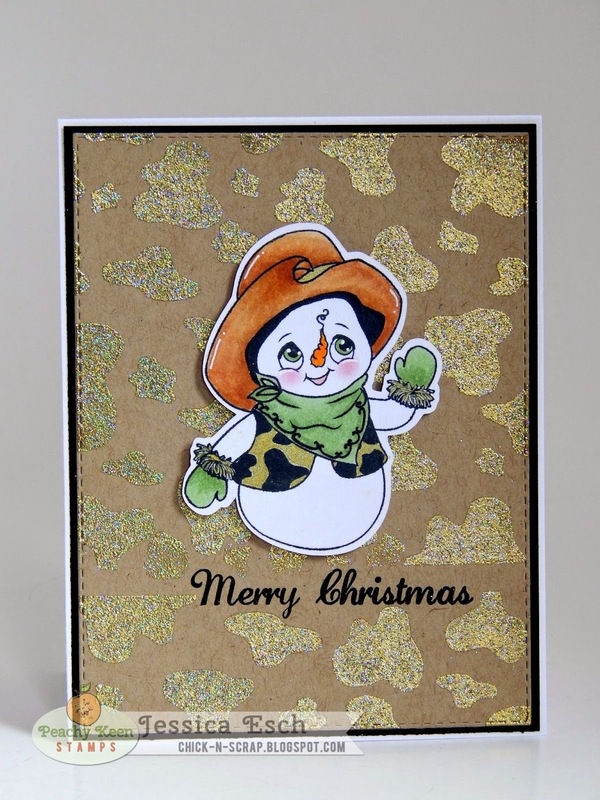 I used the cow print as the basis for my project as well as the gold, black and white color combo to make my Christmas card using 3 of the newly released stamps from PK. Here is what I came up with…. 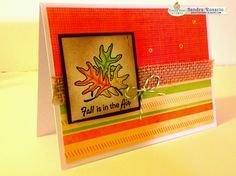 I love heat embossing….love the way it looks and the texture it adds to a project. I started this card out by using the PK~1437 Cow Print Square 4.25″ and heat embossing it on kraft cardstock using some gold embossing powder. Then using the sentiment from the new PK~1449 Holiday Sentiments set, I stamped it onto the kraft cardstock base in between a small space I left purposely left between the cow print. For that adorable image, I used the new PK~1439 Charlotte & Junior stamp, colored him using my copic markers and to make his vest match the cow print background, I used a gold pen to color it in. 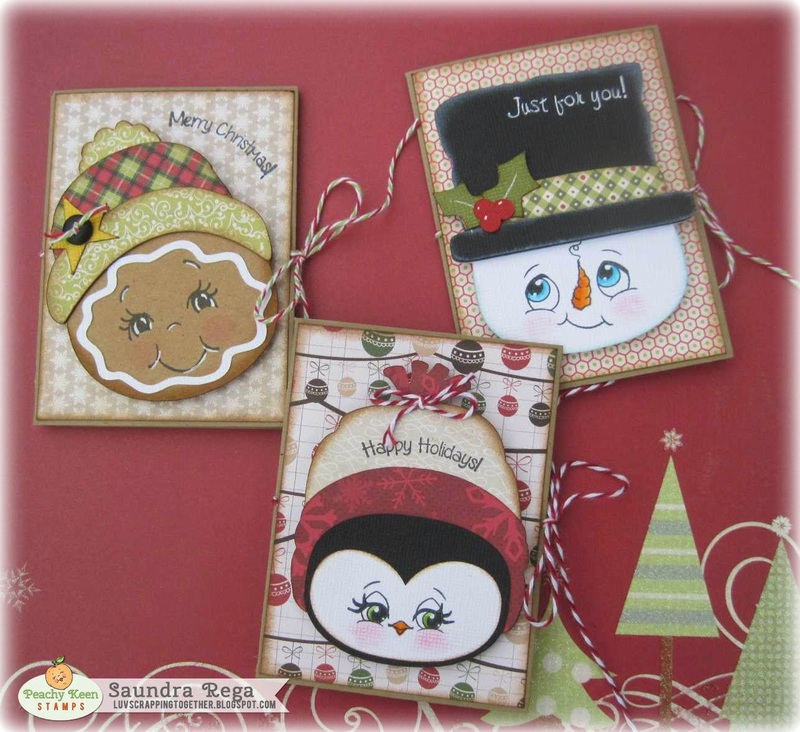 Peachy Keen has some awesome December Specials available and you can see them all HERE. Don’t forget about the SWEET PK sale that is going on as well. All the details are below and can be found in the PKS Store also! YES!!! The Christmas season is JOYFUL!! Though sometimes a bit STRESSFUL when it comes to shopping! Trying to get to a store or a website before a sale ends is MADDENING! We FEEL your pain as we still have to shop too! I can’t even begin to count how many times I’ve been to Kohl’s! LOL! After a meeting here today, PKS decided to take all the guessing out of it for you!! We are beginning this sale today and it runs through JANUARY 1st, 2015. We want your shopping experience here to be as simple and hassle-free as possible! December 2014 RANGE 4, PROMO CODE: SAVE35 Save 35% when you spend 100.01 and over! USA ONLY: All orders over $75.00 (after discounts) ship free EVERYDAY! Thanks so much for stopping by and checking out my Trendspotting project! Hope you all have a GREAT Wednesday!!! Filed under Trendspotting. Tags: Jessica Esch. Why didn't I receive my stamps?